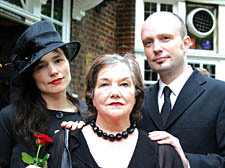 FELLOW journalists, old friends and screen stars paid their last respects to New Journal film critic William Hall at his Highgate funeral yesterday (Wednesday). More than 100 mourners packed the chapel of Highgate School, where he had spent fond early years as a pupil. Actor Burt Kwouk, who plays Cato in the Pink Panther films, and members of the Critics’ Circle of which Mr Hall was a former president, were among friends from the Highgate writer’s 50-year career in film and Fleet Street who attended. His widow, Jean, began the tributes by reading a poem he had sent to her in 1964. Then son Will played the organ as mourners sang The Battle Hymn of the Republic. The film critic, who forged long-lasting friendships with stars such as John Wayne, Michael Caine and Elvis Presley, was described by son Will as “a mentor and inspiration to many”. Afterwards, as friends gathered at a nearby pub, The Wrestlers, George Perry, the former president of the Critics’ Circle, said Mr Hall had been a “marvellously uncynical person” who brought cheer to all he met. Donations will help pay for a bench and memorial plaque next to the Highgate pitch where Mr Hall played cricket as a boy.